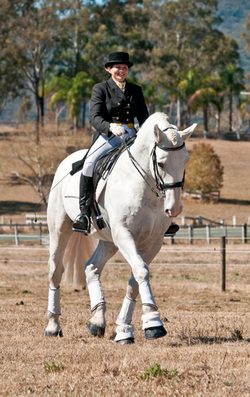 Conqueror King is the leading Irish Draught sire of Eventers in Australia. This stallion continues to produce one amazing horse after another. His progeny have had tremendous success competing at two and three star level and his young stock are ridden by professionals and amateurs alike. Imported by the Corr Family from Ireland in 1998 as a two year old, King was bred by Kenneth and Fulton Buchanan at Coole Stud Farm in Donegal on the west coast of Ireland. “King” has competed in showjumping, eventing and dressage. At 16.3hh he is a handsome, upstanding, impressive horse with lots of character. A truly influential sire, his superb technique over a fence is well known as is his big, powerful movement on the flat. Conqueror King has exceptional Irish Draught breeding including Skippy on his sire side who bred wonderful sport horses such as the well known advanced event stallion Jumbo. “King” himself has continued to upgrade the next generation with his purebred progeny, in particular Australia’s newest RID stallion Kalin Ri'. 2016 - Conqueror King RID turns 21 and to celebrate, Cushavon Park have put together a video of King and progeny that are exceeding Australia wide.